48 x 39 ⅜ in. The old, miserly woman embodies the deadly sin of greed. She sits on a low stool amidst moneybags and pots of coins. 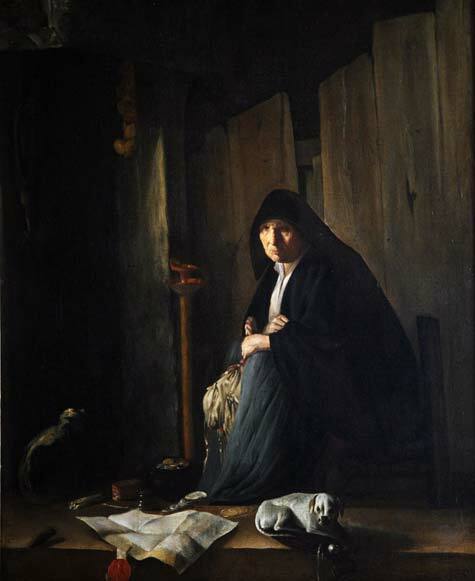 Her homely spindle is discarded on the floor, and the fire and lamp are extinguished. A snarling dog lies on an empty moneybag. The legal document hanging over the parapet suggests the hold the woman has over her debtors. A string of onions hangs on the wall – often a reference to old women as procurers of illicit love. In 1793, this painting (then entitled Avarice) was illustrated in a French book of engravings and ascribed to Rembrandt. Experts do not always agree on the authorship of a particular painting, and Allegory of Avarice is a good example. Following Rembrandt, a number of Dutch artists, most persuasively Paulus Bor, have been mentioned in association with this painting.